This is a Hubble telescope photo of a small region of space in the direction of the southern-hemisphere constellation Tucana. 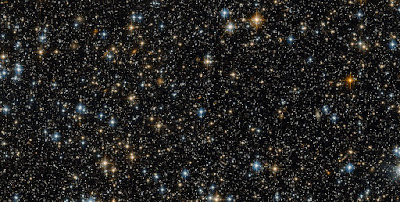 Many of the bright dots are, as they appear to be, stars -- but many of them are actually galaxies, much larger and further away than the stars. We've spent half a century exploring our own solar system, from the lunar landings to the New Horizons probe which reached Pluto in 2015, and there's still work to do. A single dot in this image may contain millions or even billions of solar systems as large and complex as our own. Found via Hackwhackers, which regularly posts astronomy photos; more background on the image here. OK, so now this picture is serving as my desktop background! 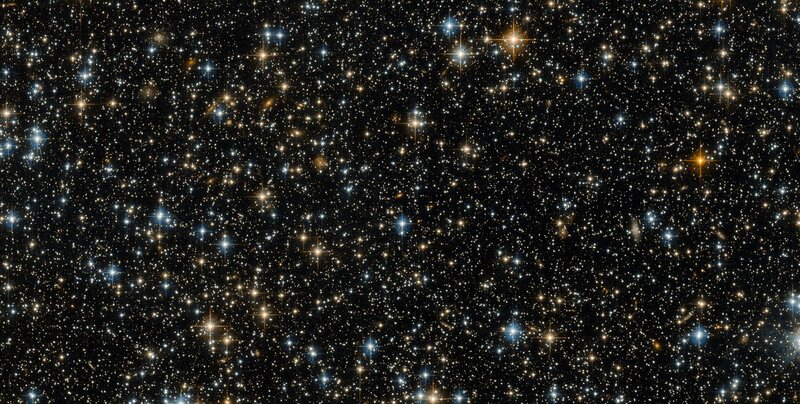 I'm always blown away by images like these; nothing better illustrates the sheer size of our universe, I think. Compared with other images of this type I've seen, this one's a bit unusual in that there are more stars in the foreground than usually seems to be the case, and the galaxies are less readily identifiable as such - you really have to look hard at the picture to distinguish a lot of them from the stars. Whenever I look at impossibly distant galaxies such as these, I can't help wondering what kinds of weird and wonderful lifeforms might be inhabitating them - I'm sure that if there is life in any of them, it'll be something infinitely more bizarre than anything dreamed up by even the most imaginative science fiction writer. It sort of pisses me off that we'll probably never be able to voyage to any of those galaxies ourselves to find out what secrets they might hold, given that Einstein's special theory of relativity forbids faster-than-light travel. Well, maybe someday we'll be able to get the Alcubierre drive to work -- although since Alcubierre himself is Mexican, Trump may ban research because he thinks it's a trick to bring in illegal aliens from other planets.